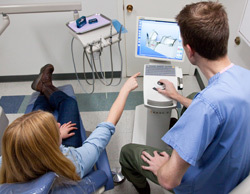 At Hawthorne Dental, we offer a full range of comprehensive dentistry for the entire family. This means that rather than looking at each tooth separately and fixing individual problems, Dr. Watson uses his advanced training and experience to consider your overall health. First and foremost, he emphasizes preventive services that lessen the occurrence of decay and empower you to take control of your dental health. When treatment is required, Dr. Watson provides conservative dentistry that is minimally invasive and preserves as much tooth structure as possible. And when cosmetic dentistry is your goal, Dr. Watson lets his artistic talents shine through to create the beautiful, natural smile you deserve. Natural looking cosmetic dentistry, including veneers and porcelain crowns, for a rock star smile! For your convenience, we accept checks, cash, debit cards, and all major credit cards. We also offer extended, interest-deferred payment options through our financing partner, Care Credit. We work with most* insurance providers, and will gladly process your insurance claims and help you maximize your insurance benefits. If your insurance plan is a Preferred Provider Option (PPO) and we’re not on the list, please contact us anyway and we’ll check your out-of-network benefits. Most patients discover that benefit levels are approximately the same whether your care is provided by an in or out-of-network provider. * Certain plans, such as OHP and Kaiser Permanente, may restrict which providers you can see. If you're not sure if you have a restricted/exclusive plan, ask your benefits administrator.